The “MACH” bar screen is a package of mechanical chain operated bar screen previously which is known as CHFF, CHFB & CHFFM. For over last two decades, The “MACH” which is front raked, front/back return bar screen, is the standard for the industry with proven reliability. The “MACH” provides protection for the processing equipment by removing oversize debris from the sewage. Chain operated cleaning rakes intermesh with the bar rack, and elevate collected debris to a discharge point where each rake is wiped off before descending on the return side of the unit. » MACH-01 is mainly applicable where front cleaning system is required and inclination angle with respect to vertical is 6° to 15° . » MACH-02 is mainly applicable where back cleaning system is required and inclination angle with respect to vertical is 6° to 30°. » MACH-03 is mainly applicable where we want to go for the fine screening, gap between bars up to 4 mm, with less capital cost. » MACH-04 Bar Screen can be inclined from 15° to 30° from the vertical. It has chain operated cleaning rakes which descend on the downstream side of the bar screen, turn around the foot sprockets, engage the bar screen at channel floor level, and ascend on the downstream side of the bar screen. Standard channel width from 1 ½’ to 6′. 6° to 45° inclination from the vertical. Standard Bar Spacing are 4 mm to 75 mm. The “CAF” bar screen is designed to protect processing equipment by removing oversize debris from the sewage immediately upon its arrival at the pumping station or treatment plant. The rake that cleans the screen is a cable operated, reciprocating design that descends on the upstream side of the bar screen, engages the bar screen at channel floor level, and ascends on the upstream side of the bar screen. Application for more deep screening. Maximum channel depth up to 250′. Standard channel width from 3′ to 9′. Standard bar spacing are 3/4″ mm to 1/2″. » CAT-01 bar screen has a single shaft and is driven by a gear reducer coupled to the drive shaft by a roller chain and sprockets. » CAT-02 bar screen has a single shaft and is driven by a hollow shaft gear reducer, directly mounted on the drive shaft. In additionally variable frequency drive can also be provided as per requirements. » CAT-03 bar screen has two shafts, one head shaft located near the trash ejector, and one drive shaft located at the back of the structure. They are driven by a gear reducer coupled to the drive shaft by a roller chain and sprockets. Bar screen can be inclined from 15′ to 45′. Standard channel width from 2′ to 30′. Standard bar spacing is 4mm to 38mm. » Panels usually have square clear opening and fabricated of galvanized steel wire attached to steel angle frames by means of steel clamp bars and galvanized steel bars. Screen panels can also be fabricated of stainless steel wire. » Adjustable stealing strips will be used at basket ends on the vertical flights. No other clearance space in the boot or elsewhere which will constitute a water passage, whether between moving parts or between moving and stationary parts. » Water spray assembly with multiple nozzles is furnished to spray the full width of the screen panels and wash debris from the screen into a discharge trough. An electric solenoid- operated valve is furnished to actuate the water spray system when the screen machinery is operating. Standard channel width from 3′ to 4′. The velocity of the water flow to the screen can be approximately 1 to 2 FPS. Approx screen chain speed 10 FPM. Sea & ocean water intake filtration. Fairfield’s STREAM GUARD is heavy duty, fully automatic self-cleaning filter screen. The screen is capable of presenting a clean filtration surface to the oncoming liquid stream at all times during continuous operation. In addition, the screen is capable of intermittent operation in order to form a mat for maximum trash removal. The filter screen is suitable for installation and operation in the proposed flow channel having an angle of inclination of 60° to 80° from horizontal. The screen provides dual filtration means it will stop the debris in two stage, first it will stop big debris at the teeth level and secondly it will stop small debris at shaft level in order to minimize compaction of the captured debris and increasing head loss through the units. The screen has clear spacing from 1 to 15 mm. Inclination referred to vertical : 60, 70, 80. The teeth are made of plastic material (Nylon). Stainless steel SS304 or SS316L is available as option. Material of frame can be Stainless Steel or Galvanized. Steel & Carbon Steel if required. A Submerged curved 1/2″ thick stainless steel rail is provided at the foot of the screen. No submerged bearing and rollers. Ease of maintenance. High separation efficiency due to the narrow spacing between teeth and the produced screening. The hook like shape of the teeth effectively prevents the screened material from dropping. The Fairfield Rotating Drum Screen meets and exceeds the expectations of operators worldwide with its innovative screening solutions. 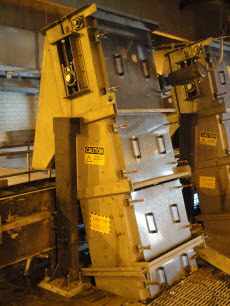 Not only does the Rotating Drum Screen remove solids, but it also washes and dewaters captured screenings. Along with a simple design and operation process, this screen has a high removal efficiency and low disposal costs. All stainless steel construction for superior corrosion resistance. Simple mechanical design requires little maintenance. Hinged structural support allows unit to pivot out of channel for maintenance at floor level. Simple drive assembly makes service easy and reduces maintenance costs. Unit is shipped fully assembled to minimize installation expenses. All mating parts are machined to ensure proper fit and operation. The Rotating Drum Screen’s mechanical design and stainless steel construction lengthen its service life. Fairfield’s MBR SPIRALFLO systems are designed to address the screening needs of industrial and municipal process treatment plants.These quality units offer many design and operational benefits. Shaft less Spiral technology enables efficient transport of stringy material or sludge. The shaft less, high-strength alloy steel spiral eliminates entanglement of solids around a shaft. No intermediate or end bearings are required, which reduces maintenance requirements. Screening, washing, and compaction all are integrated into a single unit driven by one motor located at the top of the mechanism. Wedge wire and perforated plate available in a wide range of screen openings. Throughputs up to 35 MLD. Variable lengths up to 30ft. screen inclination angel : 35° or 45°. Screenings pass paint filter test. Lower plant operations & Maintenance cost.